BEECHMONT- Douglas Clyde Smith, 51, of Beechcreek, died Saturday, May 25, 2013 at his home. Mr. Smith was born May 2, 1962 in Illinois. 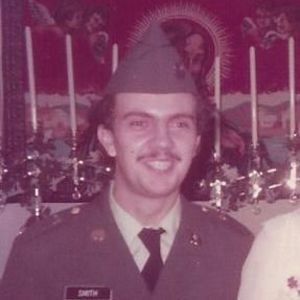 He was a housekeeper at Muhlenberg Community Hospital and a member of the National Guard. Survivors include two sons, Jared D. Smith of Drakesboro and Mikel James Smith of Drakesboro; one grandchild, Jayden Robert Smith of Greenville; his mother, Betty J. Smith of Beechmont; two brothers, Alan Dale Smith of Owensboro and Ronnie Howard Smith of Beechmont; Nieces and Nephews, Nathan and Kacee Arnold of Texas; Jeremy Smith of Owensboro; Chelsea and Bobby Emmons of Newburg, IN; Lauren Arnold of Beechmont; Cassie Hawkins of Jeffersontown, KY; Alexis Stover of Jeffersontown, KY; and Silver Dawn Smith of Owensboro. Joint Funeral services for Mr. Smith and Mrs. Smith will be Thursday, May 30, 2013 at 1:00PM at Tucker Funeral Home with Rev. Greg Brooks officiating. Burial in Wyatts Chapel Cemetery. Visitation will be Wednesday after 5:00PM at the funeral home. Online condolences may be made at www.tuckerfunealhomes.com. The beautiful and interactive Eternal Tribute tells Douglas' life story the way it deserves to be told in words, pictures and video. DOUGAL, WORK JUST ISN'T THE SAME. I WILL SO MISS SEEING YOU, ALL OF YOU FUNNY STORIES, THE WAY YOU GOT SO WORKED UP ABOUT NASCAR. AND ESPECIALLY OUR TALKS ABOUT MOVIES AND TV SHOWS. YOU WERE SUCH A DEVOTED FAMILY MAN, THE WAY YOU WOULD LIGHT UP WHEN YOU TALKED ABOUT YOUR GRANDSON. MANY PRAYERS FOR YOUR FAMILY. Doug work will never be the same. As a nightshift supervisor you were my go to person. If I got my keys stuck in a lock or had to check on those alarms in the basement (just to name a couple of things),I prayed you were working. I'll miss our conversations about books and tv shows. Mostly about your family. Such a proud husband and father. You were a good sweet soul. Thank you for being my friend. I served with Sergeant Smith for some twenty years. I was his Training NCO and Readiness NCO. During times of emergency call outs, Doug was one of those soldiers you knew you could count on to come in and help. On a moments notice, Sergeant Smith would come in ready to go wherever we needed him. I recall one night, part of Muhlenberg County was without power and we sent Doug and some of our other soldiers to run generators so the people could have water in their homes. It was a cold, icy night and it had been a while since Doug and the other soldiers had eaten. I went to take a sandwich to Doug. As I opened the door to where Doug was stationed, all I saw was the top of the hat on what appeared to possibly be a human being. It was so cold as there was no heat where he was working. He was bundled in his Army winter parka but he was still there-going strong and on the job. The greatest testimony here is not only was he still on the job in those freezing conditions, but he had one of the best attitudes about the situation. He would still be smiling and even have a funny comment under those conditions. Doug went on many missions like the one I just described. He played a role in helping many citizens of this state and surrounding states during his military career. I was proud and honored to have served with Sergeant Douglas C. Smith. He was a good Soldier who served Kentucky and the United States with honor. May God bless you, his family, during this very difficult time. Doug you will truly be missed. Night shift at MCH will not be the same. Will miss you taking about your family, movies, tv shows and books to read . My thoughts and prayers are with your family. Doug was a very kind and caring person. My thoughts and prayers are with the Smith family. Doug you were a great friend through the years, always had a smile and always called me Peaches.. I will never forget you. Seems like you should be in the halls pushing your cart.. I miss you so much..
My thoughts and prayers go out to this family. I did not know Donita well and Dougie was a wonderful person who was always cheerful and happy to help anyone with anything. Doug, you will be missed! Those of us who work night shift at Muhlenberg Communiy Hospital are close.....like family! Doug always had a smile on his face and would say "Hi Hun! " when he came through my department to clean. He loved his family! He was always talking about them, especially his little grandson! Prayer & thoughts to his family! DOUG WILL BE MISSED , HE WAS A GREAT DAD AND HUSBAND , IVE KNOWN DOUG SINCE HE WAS A KID GROWING UP AS A CLOSE NEIGHBOR WAS ALWAYS AT OUR HOUSE PLAYING , PRAYERS FOR HIM AND HIS FAMILY ALWAYS , MAY YOU REST IN PEACE ALWAYS . We send our condolences to your family, our thoughts and prayers are with you.